WOW! I can’t believe how much has happened in the short month since I last posted. I feel like time has literally flown by. And not only that, but I also can’t believe how much my husband and I have done in the last few weeks with our lives. 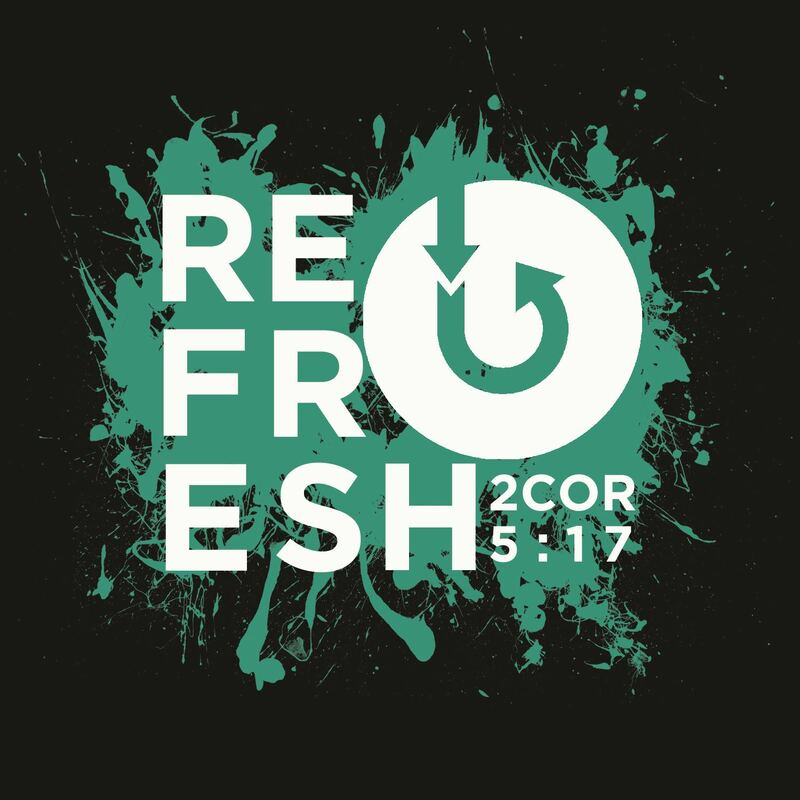 For starters, we launched a new vision and name for the Student Ministry – RE:FRESH – which is based off of 2 Corinthians 5:17. We have also been involved in numerous church activities, including Vacation Bible School and a week at Youth Camp. Things have been busy on our end, which means my photography has had to take a little bit of a backseat. However, I am back and ready for some fun things in the upcoming months! Below, I have included some pictures from our Launch for the Student Ministry and would like to include a quick tutorial for those interested in the splatter painting. The first picture below is an overall “look” of the room. 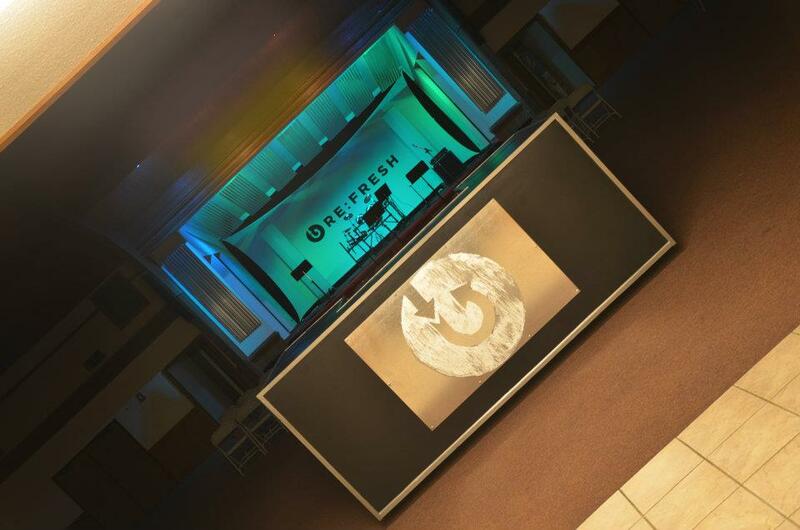 The lights and spandex backdrop, as well as a newly painted Welcome Center. 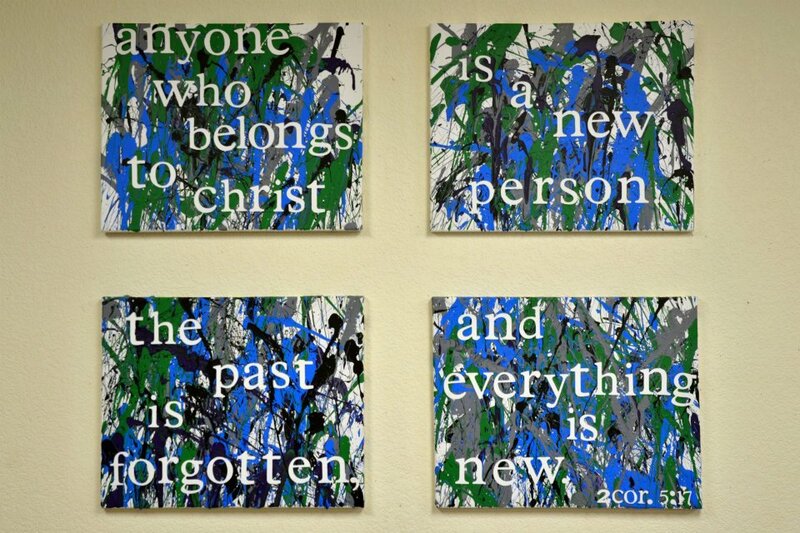 The second and third pictures were done by splatter painting. We bought Acrylic paint and canvas from Hobby Lobby, as well as a roll of vinyl to cut the letters out with. I used the Cricut machine and the free Cricut Craft Room software to cut out the letters using the Plantin SchoolBook cartridge. My husband and I stuck the letters on how we wanted them, made a giant backdrop, and took paint in our hands and threw it at the canvas. It was a mess, but the outcome was well worth it. After the canvases dried, we carefully peeled the vinyl letters off, leaving the white canvas for the letters. 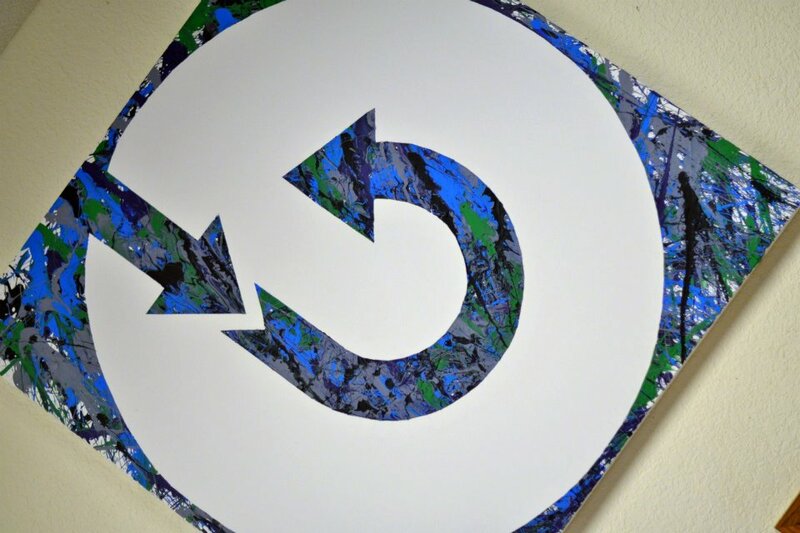 For the large canvas with the logo, we used an old school overhead projector and projected the image onto the canvas and then carefully used frog tape to seal off the parts that we wanted white. We now have students sign their names in the white spot of the large logo canvas. The last picture is our t-shirt design. I used some awesome Splatter Paint Brushes for Photoshop that I downloaded here. I love all of the awesome things you can download at Deviant Art! It’s such a great resource for Photoshop brushes and textures! For more information on RE:FRESH Student Ministry, check out our website, follow us on Twitter, like us on Facebook, or follow our boards on Pinterest! You can also keep up-to-date on my wonderful husband (a.k.a. Student Pastor extraordinaire) here. Sorry. Just had to get that plug in there!